Not quite deceased around the holidays is the dreaded copied family letter ‘catching you up’ on all the news, but more often bragging and shaming without pretense. Previously posted (AS MY FAVORITE XMAS NOVELTY SONG) is Jonathan Coulton’s “Chiron Beta Prime,” a science fiction take on the merry missive. Didn’t see that coming. Disturbingly emotional, “Christmas Card” by Terry Kitchen gently folk-jazzes the story of reading that family letter and remembering what he used to have with you when it was too early and he wasn’t ready. No! You‘re crying! Let’s get laffey making fun with Ray Stevens and “Xerox Christmas Letter.” The humor involves white trash frontin’. They got nothing, see, and they want you to know it. Go ahead, howl at their misfortunes! College Humor updates with open admissions of sociopathy and perversion in The “Honest Holiday Card Song.” Laugh at them. Do it, they’re fictional. It’s fun to say no no no (around Christmas time we call that ‘coal mining’). That Something Piñata gets experimentally kidsong for “Don’t Play Me that Christmas Song.” Uncategorizable nonsense, but in a good way. Dr. Elmo got famous for a Christmas novelty song. So, for an hilarious sequel, he spun out an FM DJ singing “Don’t Make Me Play that Grandma Song Again.” Ha what ha. On the other hand, hipsters gotta hate. Todd Chappelle (funny Philly guy) parodies McCartney’s ‘Wonderful Christmastime’ to the tune of earworm dithering. Don’t you wish they would NOT play some songs? Then why’s he gotta go the ENTIRE distance? Well, you might not just love your snowflakes. You might FEAR them. Get weirded out by Shad Weathersby as he’s “Chasing Snowflakes.” Children of the cornstarch! Aiee! Don’t forget about God! Michael Peace lays on the lounge act seeing Jesus in “SnowFlakes.” He means it. Crushing comedy into an icy ball is Jenny Stafford at The Musical Theater Factory, sitting all y’all down for that talk about uniqueness and snowflakes in, y’know, song. “The Snowflake Song” goes on a bit, but stays amusing. Tim Hawkins sings that same message to his own children. His “Snowflake”? Better singing, but harshly abrupt. Did i mention funny? Beatles wrecker Yoko Ono may have only been understood by her not-quite-there poet husband John Lennon, but oh well never mind. I don’t get her either. 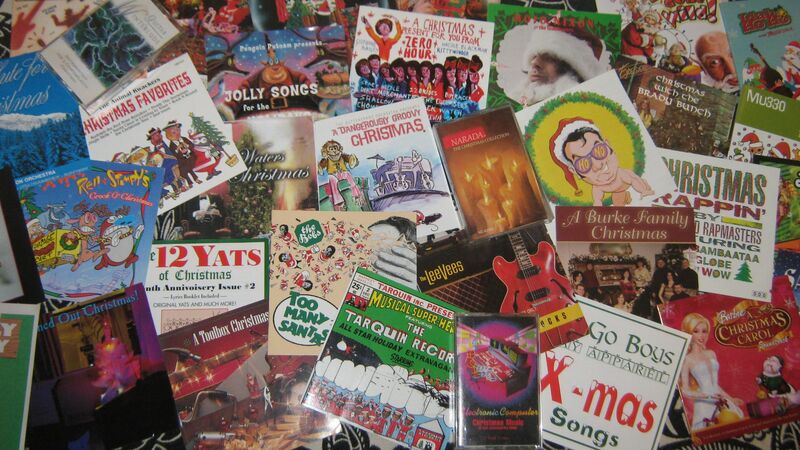 “Yoko’s Christmas Song” captures some of that oddity in a seasonal mailer to fans. And Guppy Pie has a sweet little ‘Imagine’ parody purporting to be a Christmas song (mostly about John). Jaycub Howard goes for the jugular with “A Christmas Gift from Yoko Ono.” It’s the sort of joke that’s funny to inflict on others. Social Overload goes overboard with the same joke in “A Very Yoko Christmas.” Okay this was a bad idea. Eban Schlepper starts his “Song of the Working Elves” singing, then devolves into a comedy bit. After a violent, horrifying message about our own culture we get back to the music. Santa once again is off the hook: it’s the system to blame. We get the toyland we deserve. Skippety-doodle ding dong day.